This house will allow you to live surrounded by nature, in an ecological way and respectful of the environment. 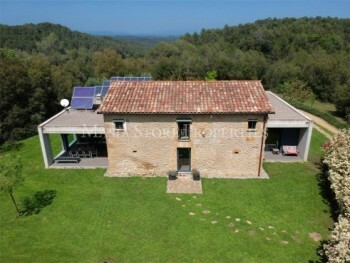 It's located near the pretty village of Vilademuls, 30 minutes from Girona and 20 minutes from Banyoles and l'Escala. The house of 375 m² is composed of a mixture of rustic and modern style, with lots of natural light. The current owners bought the 18th-century Masia and restored it completely in 2009, adding two wings on each side of the house. Upon entering, a large hall gives us access to the two areas, on the right side we find, a double bedroom, bathroom, studio-office with access to the garden. The left side leads to the living room with fireplace, spacious and modern kitchen with dining room and opened to the garden. From the kitchen is also access to the laundry and pantry, and garage suitable for 2 cars. The second floor has two double bedrooms and two bathrooms, one of them en-suite and both with fitted wardrobes. A wonderful open space, now used as a playroom, could be easily adapted to an extra bedroom. The combination of materials such as wood, stone, and metal are found throughout the house, offering an elegant and cozy atmosphere. The Masia of almost 12 hectares provides total privacy. The house has well water and solar panels, but it is also connected to all services, radial heating, and internet access. You can enjoy an easy and modern life without giving up the life you want.